The old town of Ulcinj with its fort above a small, deeply incised bay can trace its history back to the Illyrian times. Yesterday, on a warm Spring evening the smart cafes and restaurants were full, the promenade busy and the air was welcoming and civilised. Earlier that morning, a few kilometres out of town, I started to traverse a huge flat area of former salt pans (solanas) that were empty of people and only an odd assortment of rusting machines broke the skyline. The salt pans were operational until recently and made salt by evaporation for perhaps 200 years. The wetland is thus entirely artificial and, so the sign said, the site was extended in the 1980s by around 60% to the east through reclamation from the sea. This ‘big’ east end comprises huge wide lakes some reed- or rush-fringed, whereas the narrow west end is intricate salt pans some filled with oozing, black mud and others with shallow water. 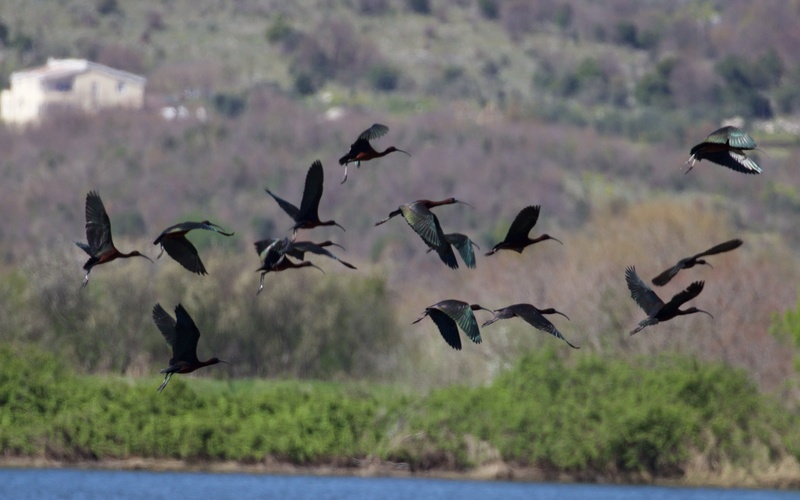 Today, the Ulcinj Solanas are best known for being one of the most important areas for wintering and migratory wetland birds in the Adriatic. The busy sea front of Ulcinj from the old fort. The empty landscape of the ‘narrow’ west end of Ulcinj Solanas. I arrived with a cold easterly blowing relentlessly under deep grey skies and drove past the decaying offices and storage sheds and then neatly aligned salt pans and parked at the start of the big end. I walked the long, long straight of the bund than ran up the centre of the site to the far end, straight into the wind. This was tough and there was nowhere to shelter. I reached a tall new hide, but the steps had lost their supports in the recent floods and the view was one of empty water on both sides, so I pressed on to the end. Here I found a comfy spot and cat-napped like a tired old tramp under the emerging sun in the lee of a large bramble bush. At this far end, there was a boundary dyke with a shed on stilts and an old fishing net hung from booms and secured by lines to the shore. Other such nets were old and abandoned with just the booms still in tact. Beyond the dyke were extensive reed beds at the east end and rush pastures and meadows to the north. A flock of sheep grazed the boundary, which was perhaps the only economic activity across the entire site. 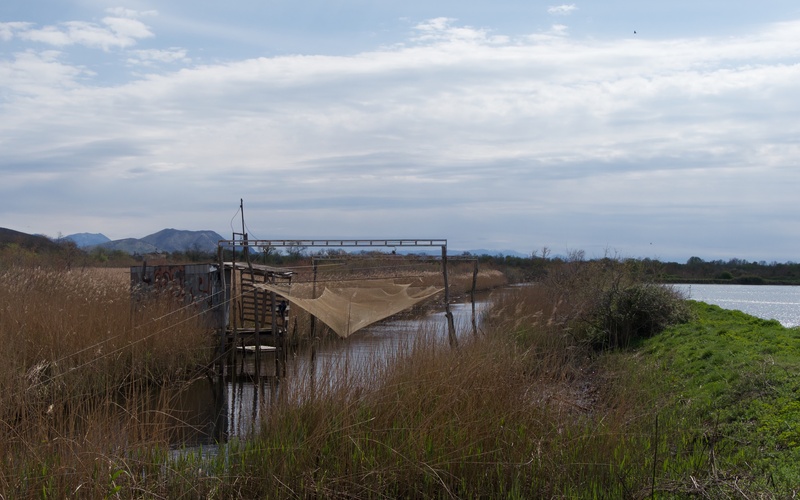 One of the few operational fishing nets on the adjacent dyke. The return journey from the east end followed the boundary to the north and then headed back west into the sun and a softening breeze. This was not only an easier but much more interesting section although, because the wetland is so huge, it was more forced march than meandering exploration. The walk round the big end was the best part of 15km. The big east end of Ulcinj Solanas with Albanian Alps beyond. The current status of the site was unclear. There are colourful and interesting signs indicating that this is all a nature reserve but there was nobody on site just the man of the gate and hunting is clearly taking place with shotgun shells here, there and everywhere. The birds too were extremely nervous and all flew when I was within a few hundred metres. The most common view of everything was the rear end of the flock as it took off in a flap. However, because the wetland is so big there is plenty of space, and so all I really did was push flocks from one side of the wetland to the other and then back again as I went up, round and down. This was a wetland that was, in its quiet corners, full of birds: perhaps a thousand greater flamingos and hundreds of gargeney and pygmy cormorant. Also big herds of coot and small numbers of grey heron, great white and little egrets as well as a dozen spoonbill and two dozen glossy ibis. 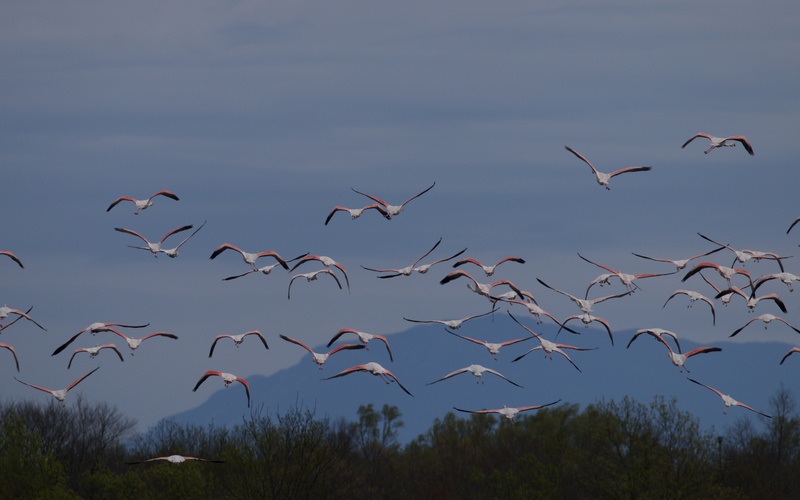 Greater flamingo and glossy ibis flocks take to the air on my arrival. 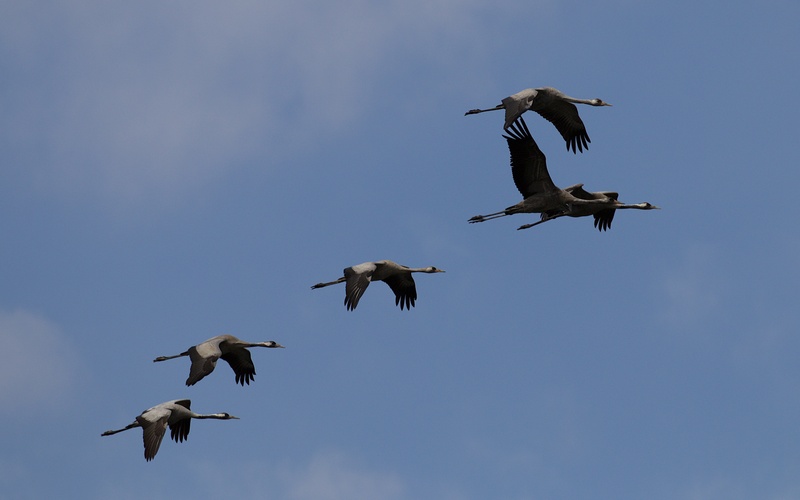 Nine common cranes flew in and round and eventually settled and were joined by two more. There were only a few waders: spotted redshank, greenshank, redshank and black-winged stilt. At least 20 snipe and six lapwing plus flocks of yellow wagtail and pipits were flushed along a flooded bund that I thought was the direct route back, but a kilometre in and I had to turn and go round the outside. Migrating common crane coming into the Solanas. 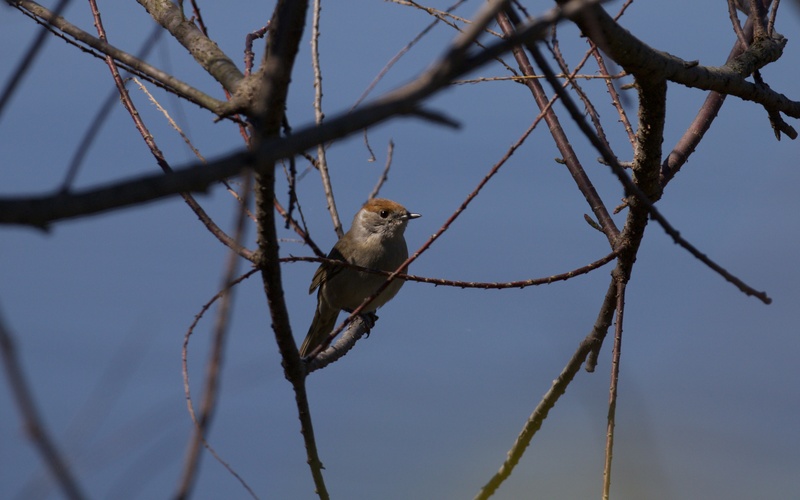 The tamarisk (Tamarix africana), red with catkins, and other boundary trees were full of blackcaps searching their bare branches for insects as well as greenfinch and a small flock of corn bunting. Nightingales sang from high thorn and bramble patches and, I think, a reed warbler sang briefly from the reeds. Swallow, sand and house martins flew low over the reeds and water whilst the weather was cold and grey. 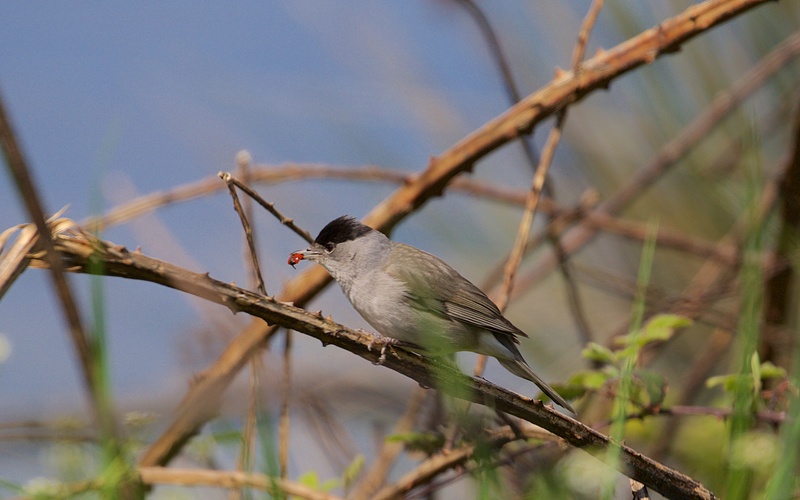 Male blackcap with ladybird prey and female blackcap. There were abundant drifts of Bellevalia romana on the grass bunds as well as occasional narcissus that were going over. A small copper butterfly (Lycaena phlaeas) was the first of the year. 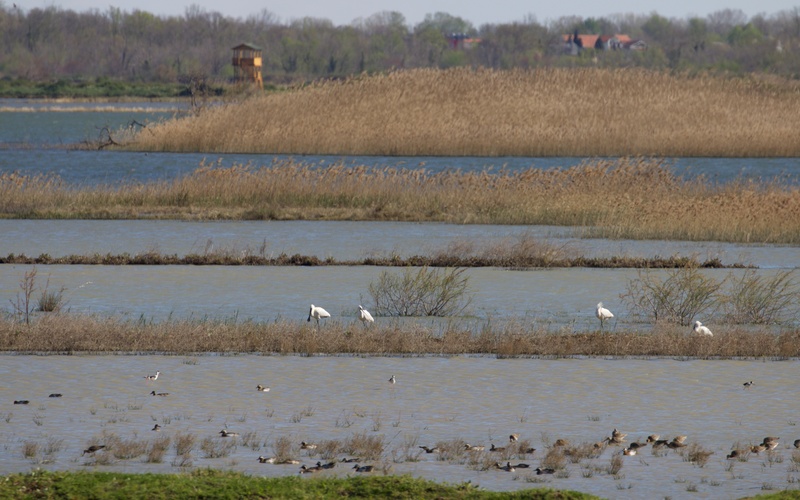 Ulcinj Solanas is a wonderful and exceptional area for wetland birds but it is so big and flat that, unsurprisingly, various development plans are being discussed. Wild birds enjoy abandoned sites like this one but is it too much of a luxury for this to continue across the entire 1,500ha site when tourism in this part of the country is so vital to the economy and so profitable? Perhaps the birds and some undisturbed wetlands will be incorporated in the final plans, but I am not so sure that human leisure and all that entails will slowly prevail and that the birds will be pushed, like the poor Illyrians before them, into the history books. Spoonbill, stilt and gargeney at a safe distance with bird tower beyond. Slowly catching up with these new adventures … Talk about intrepid … You must be getting very fit. But it is just sad to think they may be living on borrowed time BUT flaky financial europe may also be living on borrowed time so perhaps any plans to expand and spend money that doesn’t really exist may evaporate and the birds be safe. 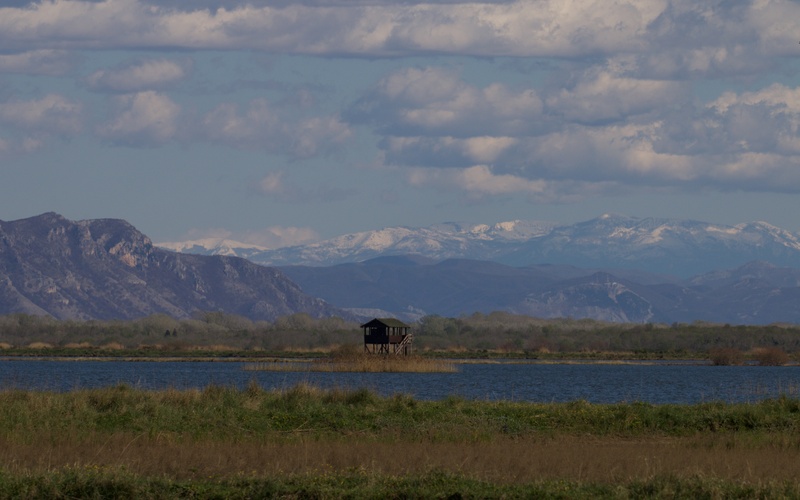 A brace of beautiful photos … Hell what a pleasure to see these birds Steve ..
Great to meet you both in Biogradska Gora. What a fantastic day that was! I hope you get to visit again later on in the spring when I imagine it would feel even more vivacious. I’m really enjoying your photos, thanks!